The world continues to progress in bold and sensational ways. New technology is proliferating in the marketplace and revolutionary products are flying off the shelves. But, for every step forward, there is always a drawback – and sadly, it is the environment that receives the most impact. It’s never too late to set things right – and global brands are setting the best examples. Every little change you take help the world advance towards a brighter future in the most sustainable manner. A great number of world-recognised brands have already taken drastic steps to become an eco-friendly brand. These companies have created a reverberating influence on the global economy with every step, inspiring other businesses – both big and small – to do the same. Now, the benefits of going green as a brand are manifold. 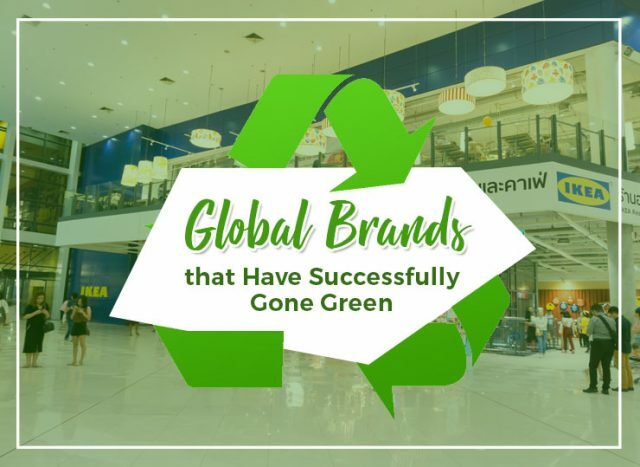 Take a look at the 5 global brands who have been setting great environmental examples and discover how going green affected their bottom lines and reputation. Furniture and home accessories brand, IKEA has dedicated its entire business processes to sustainability. Its green strategy titled, “People & Planet Positive” starts with their supply chain where it aims to source its materials from the most sustainable providers. It employs a diverse set of ecological tactics such as powering its facilities in the US with solar panels and operating wind farms to power two of its locations, to name a few. Today, the company is working towards its goal to be powered by 100% renewable energy by 2020 and further encourage the market to live a more eco-conscious lifestyle. Unilever has made sustainability as part of its identity. In 2010, it launched its sustainable living plan with a primary goal of doubling the company’s bottom line while reducing its environmental impact by 50% in 10 years. The plan may seem a little ambitious, but in as little as 5 years, the company already made remarkable strides which include reducing its nonhazardous waste to landfills by 75% and tripling its supply of agricultural raw materials from sustainable resources. In the long term, the company’s purpose is simple and clear: to make a sustainable living commonplace. Panasonic doesn’t boast as many awards as most of its competitors, but it has been consistently applauded for its persistent green efforts. Like many brands on the list, the company has introduced an ambitious eco-friendly plan which entails a total overhaul of its daily operations. To start, Panasonic relocated its North American headquarters in a move to reduce the commute distance and the carbon footprint of its employees. Moreover, under its product to product scheme, it has started recycling plastics from its products – TVs, refrigerators and air conditions – and reuse them in new household appliances. It has also planted more than 3 million trees since 2007. Although Nike stands as one of the most valued brands in sports, it actually didn’t start with a stellar record in terms of sustainability. But, when it started to introduce green initiatives to their brand, it never stopped reducing its carbon footprint, one step at a time. Nike’s success on sustainability lies in the full disclosure of its changes in business practices. Its efforts included introducing an app that lets users compare the impact of different fabrics on the environment and redesigned boxes with less packaging. It also partnered with NASA in attempt to further green its processes. Frito Lay is a global brand that takes up 40% of the savory snacks segment in the United States – and with its efforts to invest in new ways to manufacture its product in the greenest way possible, it is evident that the PepsiCo subsidiary recognises its responsibility to the environment. The company spent a good 10 years introducing new and sustainable methods in its Arizona plant. It was done by utilising wood waste to generate steam, converting its truck fleet into electric and running the facility on landfill gas. It also debuted the plant-based compostable SunChips bags in 2008, only consumers complained that it was noisier than the original bags. But, it still was an effort worth a try. The list of companies that have successfully gone green goes on, and no matter how they wish to implement green practices, each can still make a huge difference. Now, even if you’re not a business at par with these names, there are still countless and effective ways on how to switch to an eco-friendly business. Do you know any other green brands that should be on this list? Let us know by commenting below.